These are fairly obvious in their meaning. Live media by definition are face-to-face events, such as lectures, seminars, and one-on-one face-to-face tutorials. A ‘live’ event requires everyone to be present at the same place and time as everyone else. This could be a rock concert, a sports event or a lecture. Live events, such as for instance a seminar, work well when personal relations are important, such as building trust, or for challenging attitudes or positions that are emotionally or strongly held (either by students or instructors.) The main educational advantage of a live lecture is that it may have a strong emotive quality that inspires or encourages learners beyond the actual transmission of knowledge, or may provide an emotional ‘charge’ that may help students shift from previously held positions. Live events, by definition, are transient. They may be well remembered, but they cannot be repeated, or if they are, it will be a different experience or a different audience. Thus there is a strong qualitative or affective element about live events. 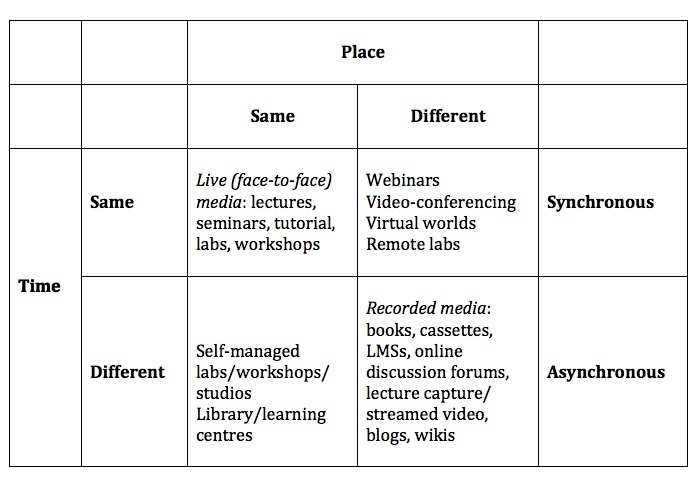 Figure 6.5.2 illustrates the main differences between media in terms of different combinations of time and place. 6.5.3 Why does this matter? Overall there are huge educational benefits associated with asynchronous or recorded media, because the ability to access information or communicate at any time offers the learner more control and flexibility. The educational benefits have been confirmed in a number of studies. For instance, Means et al. (2010) found that students did better on blended learning because they spent more time on task, because the online materials were always available to the students. Research at the Open University found that students much preferred to listen to radio broadcasts recorded on cassette than to the actual broadcast, even though the content and format was identical (Grundin, 1981; Bates at al., 1981). However, even greater benefits were found when the format of the audio was changed to take advantage of the control characteristics of cassettes (stop, replay). 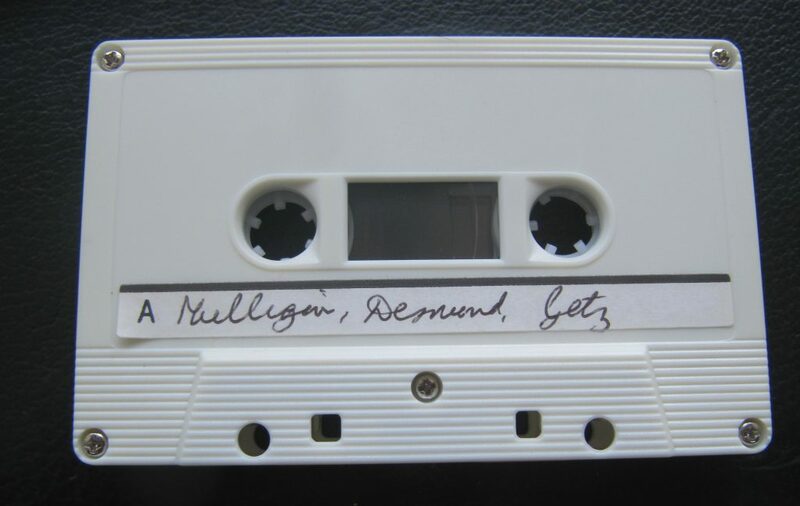 It was found that students learned more from ‘designed’ cassettes than from cassette recordings of broadcasts, especially when the cassettes were co-ordinated or integrated with visual material, such as text or graphics. This was particularly valuable, for instance, in talking students through mathematical formulae (Durbridge, 1983). This research underlines the importance of changing design as one moves from synchronous to asynchronous technologies. Thus we can predict that although there are benefits in recording live lectures through lecture capture in terms of flexibility and access, or having readings available at any time or place, the learning benefits would be even greater if the lecture or text was redesigned for asynchronous use, with built-in activities such as tests and feedback, and points for students to stop the lecture and do some research or extra reading, then returning to the teaching. The ability to access media asynchronously through recorded and streamed materials is one of the biggest changes in the history of teaching, but the dominant paradigm in higher education is still the live lecture or seminar. There are, as we have seen, some advantages in live media, but they need to be used more selectively to exploit their unique advantages or affordances. 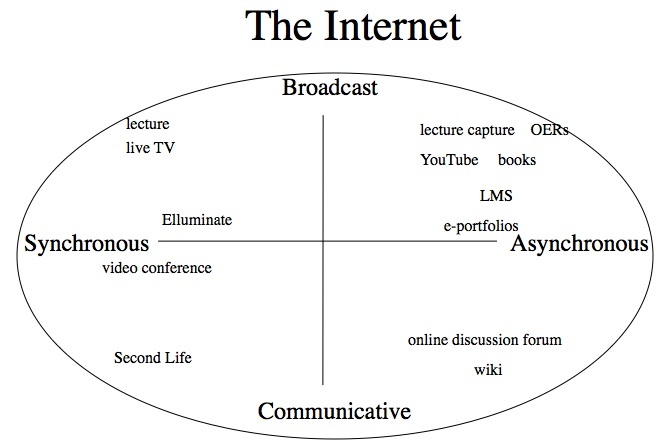 Why the Internet is so important is that it is an encompassing medium that embraces all these other media and technologies, thus offering immense possibilities for teaching and learning. This enables us, if we wish, to be very specific about how we design our teaching, so that we can exploit all the characteristics or dimensions of technology to fit almost any learning context through this one medium. It should be noted at this stage that although I have identified some strengths and weaknesses of the four characteristics of broadcast/communicative/ synchronous/asynchronous, we still need an evaluative framework for deciding when to use or combine different technologies. This means developing criteria that will enable us to decide within specific contexts the optimum choice of technologies. 1. Does this categorization of technologies make sense to you? 2. Can you easily place other media or technologies into Figures 6.5.2 and 6.5.4? What media or technologies don’t fit? Why not? 3. Can you imagine a situation where an audio cassette might be a better choice for teaching and learning than Second Life (assuming students have access to both technologies)? And can you imagine the opposite (of where Second Life would be better than an audio-cassette)? What are the defining criteria or conditions? 6.5 The time and space dimensions of media by Anthony William (Tony) Bates is licensed under a Creative Commons Attribution-NonCommercial 4.0 International License, except where otherwise noted.